Los Angeles is known the world over for boundless optimism and opportunity, for the manifestation of dreams through risk taking, ingenuity, an embrace of entrepreneurs, and craftsmen, of science, business, design, and artistry. Our communities are rich with expertise and resources. Too often, our learning spaces are isolated from the vitality of the surrounding community. As a result, students interpret this to mean that learning and creative work is solely a feature of school. In order for students to see a connection between school-based education, career, and life, we need to create bridges between them. Green Dot Public Schools’ commitment to students’ potential means providing an educational space where students, teachers, and professionals can meet and collaborate to develop real world skills and think in unconventional ways. The JetSpace at Alain Leroy Locke College Preparatory Academy is an example of such a space. The JetSpace is a recently renovated 21st century innovation space and library. The space is modern, open, bright, and brimming with technology and creative space. It provides an opportunity for students to engage with inspiring mentors from a wide variety of professional backgrounds, exercise creativity, and build self-directed learning skills, often with the aid of cutting edge technology (e.g., virtual reality, 3D printing, robotics). The JetSpace is also a launchpad for learning journeys beyond the school environment, including guided field trips to corporate campuses, internships, experiences, and site based projects. Excitement follows the surprise. Teachers and staff have witnessed high levels of engagement and sustained interest in JetSpace activities. Students are keen to connect to professionals in their community who can expand their horizons, inspire them and also demystify the world of work. And it turns out that many professionals feel richly rewarded sharing their expertise and professional trajectories with young minds and passions. “We want people like you – designers, architects – in here. People who build things!” offered a student at a recent professional panel session on design mind. 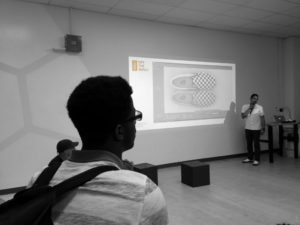 During the inaugural 2015-2016 school year, JetSpace offered two deep dive pilot programs – a Shoe Design Program with Vans and Massachusetts Institute of Technology (MIT), where students created innovative shoe soles, and a Future of Fashion Program with NASA and MIT, in which students learned about the growing frontier of wearable tech and created products of their own using 3D printing technologies. 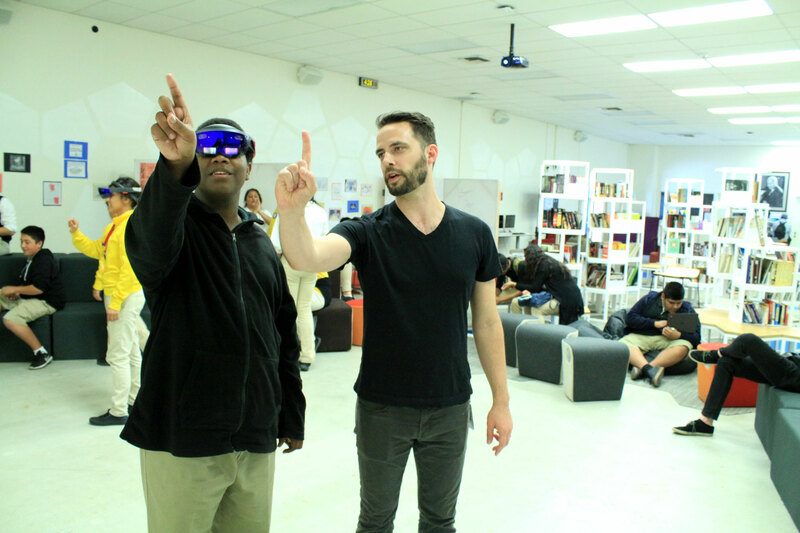 Both programs introduced students to Design Thinking, the process of identifying a problem, conducting research, ideating, creating prototypes, getting feedback, and iterating. Facilitators taught students how to identify problems, and then supported them in developing a collaborative problem solving environment, relevant skills, and the confidence to address the issues and provide solutions. “It’s a thrill to be in this space right now and to see students comfortably learning,” says MIT Program Manager, Leigh B. Estabrooks. “They’re taking books off shelves and engaging in conversations. Often times it takes the right environment for Design Thinking to thrive, and that’s not common in the typical classroom,” says Estabrooks. The JetSpace and its programs help link learning to college and career. At a practical level, the space connects students to internship and career opportunities. Vans and NASA professionals have proven dedicated to networking with all students, and to providing additional opportunities for students that applied themselves and excelled. Students manifested their ideas and created tangible examples of their work – shoe designs for water sports, hiking, and basketball, wearable tech that addressed safety issues as well as fashion trends. In the pilot phase, forty students engaged in innovative learning programs that taught Design Thinking and engineering principles. Working with professionals in their community, they built important relationships, skills, and a new found sense of confidence in the application of their learning and ideas. 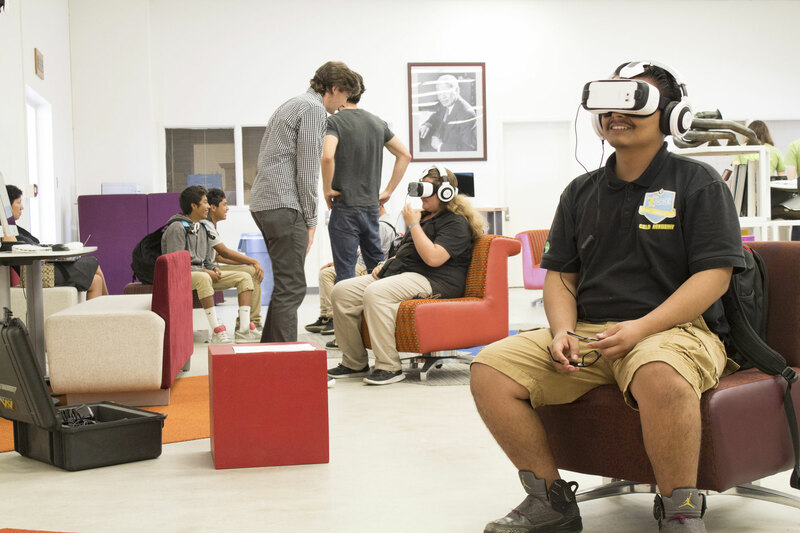 As we begin the 2016-17 school year, the JetSpace is ready to accelerate student growth by offering an exciting menu of experiences, deep dive innovative learning programs, and available technology offered in collaboration with a corps of the finest educators and mentors in Los Angeles.